Conductor Kurt Masur, Leader Of Orchestras In New York And Beyond, Has Died : The Two-Way Kurt Masur, the German conductor whose career spanned from leading an orchestra in East Germany to more than a decade of reshaping the New York Philharmonic, has died at age 88. Conductor Kurt Masur, seen here performing in Leipzig in 2007, announced in 2012 that he had been suffering from Parkinson's disease. He died at age 88. 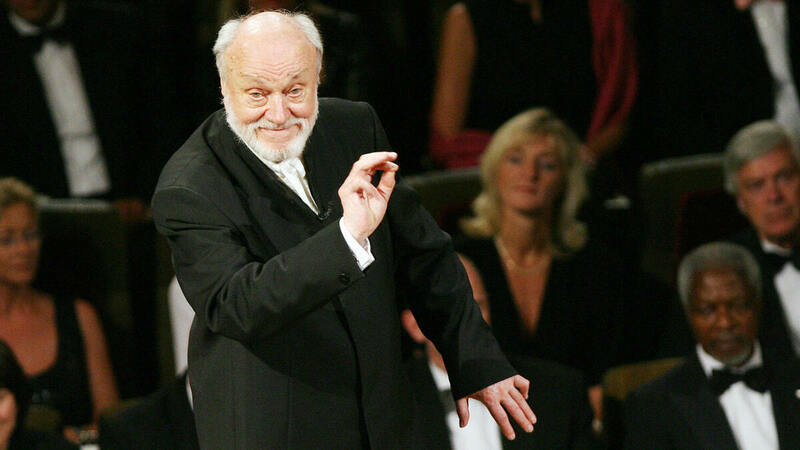 Kurt Masur, the German conductor whose career spanned from leading an orchestra in East Germany to more than a decade of reshaping the New York Philharmonic, has died at age 88. A guest conductor who traveled the world to lead elite musicians, Masur announced in 2012 that for several years he had been suffering from Parkinson's disease. Months earlier, he was hospitalized after falling off the podium during a performance with the Orchestre National de France. In addition to the renown Masur received for his talents as a conductor and orchestra leader, he was also known as a passionate supporter of musical education at every level, from inner-city schools to conservatories. The only conductor to hold the title of Music Director Emeritus of the New York Philharmonic, Masur had also been music director of the Orchestre National de France in Paris and principal conductor of the London Philharmonic Orchestra. And for decades, he maintained a relationship with the Leipzig Gewandhaus Orchestra, where he was kapellmeister — occupying the same post as Bach and Mendelssohn. Masur is also well-known as a humanist. In 1989, when mass demonstrations against East Germany's communist government threatened to turn violent in Leipzig, Masur's issued a message from himself and other leading citizens over public loudspeakers, asking all sides to remain calm and have a peaceful dialogue. "It was a peaceful revolution. And it was proof that people in the German Democratic Republic (GDR) had learned to act in a very politically deliberate way. I'm still impressed by how smart they were — and by the way the security forces remained calm. On that day, not even a single window was broken." And that night, Masur said, he led his orchestra: "The revolution was Monday evening and, by Tuesday morning at the latest, everyone went back to work as usual. I will never forget that concert." Exactly one month after that large protest, the Berlin Wall fell. Masur's career intersected with history again in 2001, when, days after the attacks of Sept. 11, he conducted Brahms's "German Requiem" in a concert benefiting the World Trade Center disaster relief fund. In a piece of Pulitzer-winning cultural criticism, Newsday's Justin Davidson wrote of that night, "In lieu of a festive opening night gala, the New York Philharmonic offered a benefit performance of Brahms' 'Ein Deutsches Requiem' as a balm, and it was reverently accepted." It was the start of Masur's final season as musical director in New York, and instead of meditating on loss and death, Davidson wrote, the night's program "offered the first possibility of joy - not of simple-minded escapism, or indefinitely postponed redemption, but of someday shaking off the grim numbness of these past days." "Enter Mr. Masur, the darkest of dark horses. A shambolic bearded giant who stood 6 foot 3 and favored bolo ties offstage, he may have lacked the dynamism of Bernstein and the avant-gardism of Boulez. But what he could bring to the Philharmonic, the search committee came to believe, were attributes that at the time were even more urgently needed: the respect of its players, before whom he had appeared as a guest conductor; a deep knowledge of the Germanic repertoire that is the foundation stone of the Western symphonic canon; and a tasteful, unswerving fealty to the intent of composers." The conductor was also known for being unintimidated by orchestras, holding them to stringent standards in rehearsal. Masur "led the Philharmonic in 909 performances; hired 42 Philharmonic musicians; led the Orchestra on 17 tours around the world, traveling to 75 cities in 30 countries, including the first-ever Philharmonic concerts in mainland China; and expanded the Philharmonic's education programs," according to a biography provided by the New York Philharmonic. During his distinguished career, Masur recorded dozens of albums. His name appears twice on the list of Performance Today's essential classical music: once for conducting Richard Strauss' Four Last Songs with soprano Jessye Norman and the Leipzig Gewandhaus Orchestra, and again for conducting Brahms' Violin Concerto in D, Op. 77 with violinist Anne-Sophie Mutter and the New York Philharmonic.